The global artificial intelligence in medicines market was valued at $719 million in 2017 and is estimated to reach $18,119 million at a CAGR of 49.6% from 2018 to 2025. Artificial intelligence (AI) in medicine is used to analyze complex medical data by approximating human cognition with the help of algorithms and software. The development of novel pharmaceuticals and biologicals through clinical trials can take more than a decade and cost billions of dollars during that tenure period. AI technology can help to make this process faster and cheaper, which in turn is expected to help improve the efficiency of pharmaceutical and biotechnology companies. The major factors that drive the growth of the AI in medicine market include dearth of skilled healthcare professionals and increase in the processing power of AI systems that is estimated to help improve the efficiency of drug discovery and management of clinical trials. In addition, the growth in importance of precision medicine and rise in funding for the R&D activities of the use of AI technology in the field of medicine are anticipated to help boost the market growth. However, limited acceptance from healthcare professionals and limitations of AI decision-making can hamper the market growth. Moreover, untapped market opportunities available in developing regions such as India and China help open new avenues for the market growth during the forecast period. Based on the product type, the market is segmented into hardware, software, and service. The software segment occupied the highest share in 2017, owing to continuous software innovation that caters to the requirement in the healthcare sector. The hardware segment is projected to witness the highest growth rate during the forecast period. Based on technology, it is classified into deep learning, querying method, natural language processing, and context aware processing. 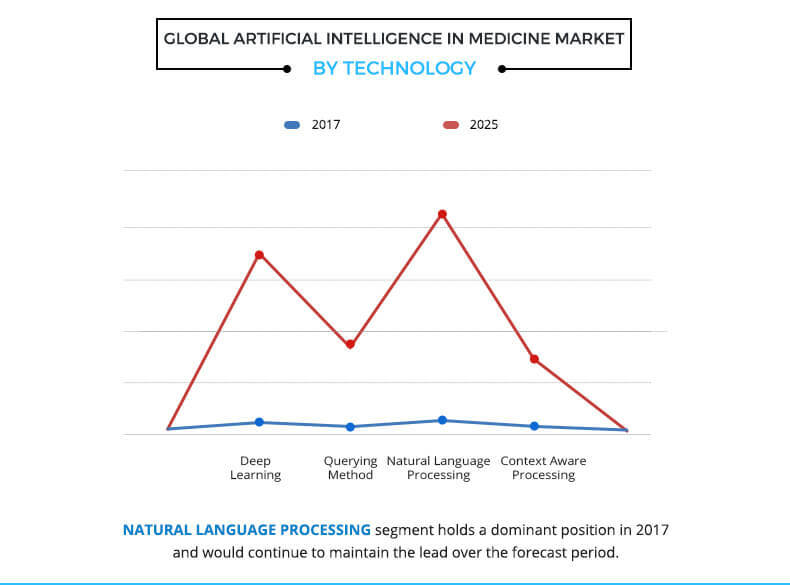 The natural language processing segment accounted for the highest share in 2017 as this technology in frequently used during various applications such as drug discovery and clinical trial identification. 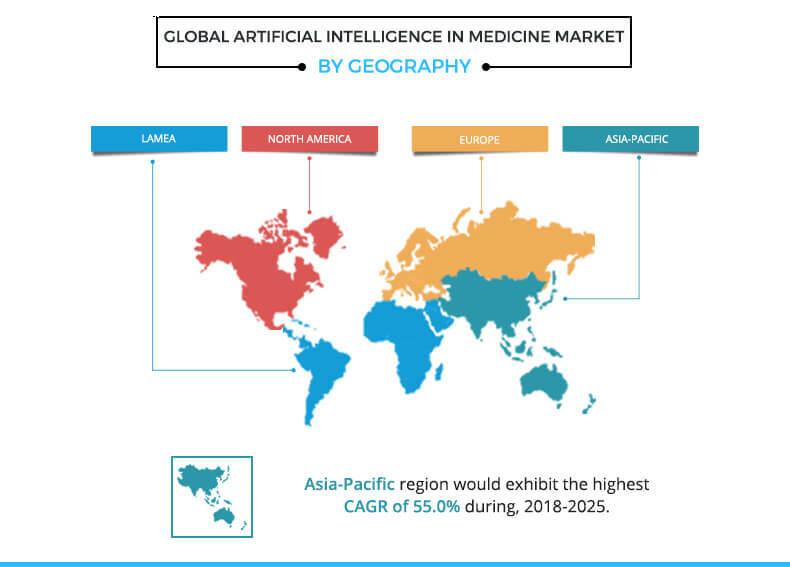 As per region, the artificial intelligence in medicine market is analyzed across North America, Europe, Asia-Pacific, and LAMEA. North America accounted for the largest market share in 2017 and is expected to retain its dominance throughout the forecast period owing to the availability of capital investments and increase in adoption of AI technology. The key players operating in the global artificial intelligence in medicine market include Welltok, Inc., Intel Corporation, Nvidia Corporation, Google Inc., IBM Corporation, Microsoft Corporation, General Vision, Inc., Enlitic, Inc., BioXcel Corporation, and Berg Health. Other prominent players in the value chain include InSilico Medicine, Inc., Globavir Biosciences, Inc., GNS Healthcare, Flatiron Health, Benevolent AI, Atomwise, Verge Genomics, Cloud Pharmaceuticals, and Recursion Pharmaceuticals. The global market is comprehensively analyzed with respect to product type, technology, application, and region. AI systems can accomplish challenging tasks without human intervention, hence there is a growth in demand for these systems in the field of medicine. The pharmaceutical industry is beginning to invest in artificial intelligence (AI) to develop better biomarkers, to identify drug targets, and design new drugs. There is an increase in the number of partnerships between large pharmaceutical companies and AI start-ups in 2017. In addition, there is advancement in the technology related to deep learning and natural language processing that is used in AI system and helps improve the efficiency of data management in the field of medicine. Currently, AI technology are used for various purposes by pharmaceutical and biotechnology industries such as retrieve patient information, maintain clinical data, drug discovery, and lead optimization. Moreover, these systems can enhance their perception and reasoning power, which helps the system to perform the repetitive functions carried out manually. Thus, the use of AI systems can help reduce numerous human errors such as unstable hand movements during the development of any drug and precisely measure the dosage of a pharmaceutical drug. Moreover, they are used to analyze the medical records of a patient and predict disease onset. The use of technologically advanced products is highest in North America, owing to availability of capital investments and increase in adoption of these products for the use of AI technology by the pharmaceutical and biotechnology companies. Furthermore, rise in disposable income, surge in healthcare expenditure in the developing countries, such as China and India, and increase in adoption of AI systems contribute towards the growth of the Asia-Pacific AI in medicine market. 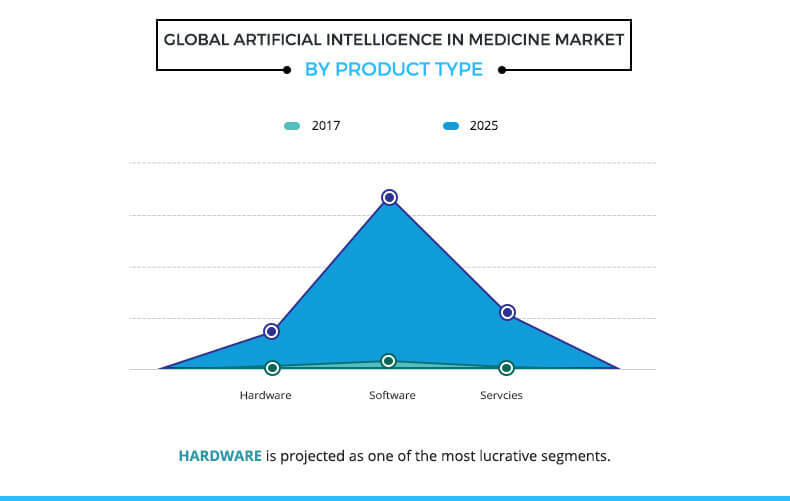 "Artificial Intelligence in Medicine Market"